Citation: C N Trueman "Special Operations Executive"
The Special Operations Executive was ordered by Winston Churchill to “set Europe ablaze”. The Special Operations Executive’s (SOE) main task was to link up with resistance movements – primarily the French Resistance – to undermine the Germans in the countries they had occupied. In 1940, after the fall of France, Britain had a rudimentary approach to assisting civilian resistance movements in Europe. Section D existed as part of the Secret Service. Its task was to support subversive movements in occupied countries. MI (R) also existed. It was part of the War Office and its job was to support irregular operations conducted by personnel in uniform. However, little thought had been given to helping those civilians who not only wanted to fight back at the Germans, but also wanted to help out the British. Both Section D and MI (R) proved relatively ineffective in supporting the resistance movements in western Europe – too much inter-departmental rivalry was an issue. Therefore, a new start was required, an organisation that was free from rivalry and that had a fresh outlook on how to support the resistance movements of Europe. This led to the creation of the Special Operations Executive in July 1940. Its headquarters was in London and it had regional headquarters in Cairo and Delhi. A link with America was also formed. SOE was placed under Dr Dalton who headed the Ministry of Economic Warfare. Dalton was not a member of the War Cabinet which would have given him greater access to Churchill and initially, due to its lack of experience, SOE set its sights too high. One SOE plan, sent to the Chiefs-of-Staff, requested equipment for Europe’s resistance movements that would have taken six months alone to transport by air. Dalton and SOE soon set themselves more realistic targets. The most obvious one was how to communicate with the resistance movements of Europe. Any form of radio communication was open to interception. There was communication with Polish and Czech movements but only on a small scale. Probably, the biggest problem SOE experienced, was that there was no blue print to study. What Churchill had ordered had never been done before – there was no rule book to go by. Dalton and SOE had to make up the rules from the beginning. One further disadvantage SOE had was convincing those in the military hierarchy that what they planned to do was worth supporting. Acts of sabotage were difficult to verify – especially their success. Communication was invariably slow – so good news took time to arrive. There were many in the military who saw the SOE as a distraction from the ‘proper’ fighting that had to be done. The only way that SOE could overcome these three problems was to get agents on the ground in occupied Europe. This provided SOE with its next problem – suitable candidates to be SOE agents. Once trained, the most common way of getting agents to mainland Europe was by plane. Parachute drops could be made by Whitley and Wellington bombers. However, these were obvious targets from the ground. SOE needed a smaller plane that was difficult to see but tough enough to land on crude runways. In the Lysander it got the perfect plane. By mid-1941, SOE agents were beginning to land in Europe. All manner of problems were experienced – contacting the ‘reception committee’, informing them that a drop was going to take place, poor weather at the last minute which might stop a flight etc. The so-called reception committees were very much at risk. By simply being out at night they were breaking curfew regulations imposed by the Germans and informants were a danger that put everybody at risk. The work of the SOE became more sophisticated as they became more experienced. The ability of theLysander to land, allowed SOE to pick-up ‘special people’ who needed to be de-briefed in London. 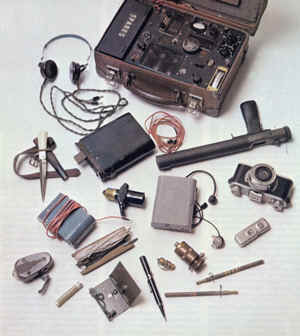 One of the most vital SOE tools was clandestine radio communications. A special wireless set weighing less than 40 lbs was developed. It looked like an ordinary suitcase. The plan was for every SOE organiser to take to occupied Europe a qualified radio operator. Every SOE operative was trained in parachuting, unarmed combat and self-defence. Those who had particular skills in explosives, trained to perfect these skills. The same was true with wireless operators. SOE schools were set up under the greatest of secrecy to train potential SOE operators. The final part of training for any SOE person was his or her so-called ‘cover story’. Each SOE operative had to fit in with his/her background. The slightest mistake would have been punished in the most severe manner. Therefore, no ‘Frenchman’ would wear shoes made in Great Britain or smoke British made cigarettes. Some SOE operatives not only provided Allied intelligence with vital information, they also became part ofWorld War Two history – the likes of Captain Henry Rees, Violette Szabo, Pearl Witherington and Wing- Commander Yeo Thomas.